My earliest memories are of reading the "funny pages" of the newspaper in nursery school. As a hyperactive child, my family would always say that when I wasn't moving, my brain was, and that the only thing to get me to sit still was a book. Given this love of reading, it seemed natural to try my own hand at writing. 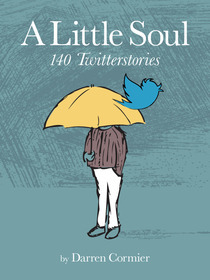 I am the author of A Little Soul: 140 Twitterstories, one of the first books of its kind. All stories in the collection are 140 characters or less. My fiction has appeared in Opium Magazine, Meetinghouse, Amoskeag, Every Day Fiction, Arch Literary Journal, One Forty Fiction, Ether Books, and Thrice Fiction. I also invented the giraffe. A hyperactive imagination; a love of messing with structure and expectations; a love of words and having fun with all the weird words in our language; a quietly competitive spirit; a constant questioning of what is possible (which has gotten me in trouble before). I want to know the pain inside of every person, and to then show that through each of my characters and, hopefully, by showing that pain, help them (and us) heal; to continue to attempt to make proud those who believed in and encouraged my abilities as a writer. Favorite Authors: Dan Chaon, Jim Shepard, Lydia Davis, Anne Fadiman, Jennifer Egan, Mark Z. Danielewski, Merle Drown, Nick Hornby, Mike Hancock, Gore Vidal, Italo Calvino, Georges Perec, etc etc etc. You have a bit of designer in you don't you? Many of your favorite authors were subjects of study for my critical thesis in The Role of Design in Fiction. Nice to see you here. I'm very new to this forum. Loving it! Thank you, Darryl. Glad I could help. And thanks for the welcome as well. You made me laugh, and I haven't done that in a very long time. Thanks and welcome. And here you are. Welcome! You must log in to write on Darren Cormier's wall.